The mission of the Town of Amherst Department of Emergency Services and Safety is to ensure the safety of the citizens of the Town of Amherst, NY during large scale/high impact emergencies. 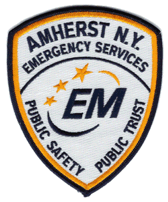 By maintaining and continuously evaluating emergency plans, providing training to enhance knowledge, skill and abilities, establishing clear roles and responsibilities of staff, and promoting emergency awareness throughout our community, the department will ensure the continuity of Amherst Town government. Through our strong commitment to excellence and focus on teamwork, our actions will produce successful outcomes. If you or someone in your household has a disability or a special medical need, please let us know by submitting an Emergency Response Data Form. Click here to view the Town of Amherst Flood Plan Annex document. Click here to learn more about the hazard mitigation plan. Please see this flyer for information on the ECWA customer alert system. Please refer to the Track Us Announcements Page for information on local storms and emergencies . The New York State Department of Transportation implemented 511 New York (511NY) in 2008 as a free, comprehensive travel information system geared to meet the multimodal needs of commuters, long-distance and local travelers, tourists and commercial-vehicle operators, by providing up-to-the-minute, comprehensive transportation information. Visit 511ny.org/about for more information.